LISTED PRODUCT: A product that has been produced under underwriter lab's listing and follow-up service and that bears the authorized listing mark of U. L. as the manufacturer's declaration that the product complies with U.L. 's requirements in accordance with the terms of the follow-up service agreement. RECOGNIZED COMPONENT: A part or sub-assembly covered under U.L. 's recognition service and intended for use in listed, classified, or recognized products. a recognized component is incomplete in construction features or restricted in performance capability so that determination by U. L. of its acceptability in a product is necessary. CERTIFIED PRODUCT: A product that has been produced under canadian state approval and follow-up service and that bears the authorized certification mark of C.S.A. as the manufacturer's declaration that the product complies w1th C.S.A. 's requirements in accordance with the terms of the follow-up service agreement. 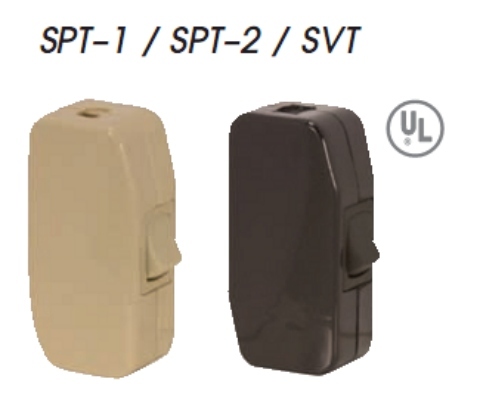 SPT-1: is no longer approved for external wiring of table and floor lamps or lighting fixtures, SPT-2 and SVT are approved. NON-LISTED COMPONENT: many items shown in this catalog are not listed or recognized by underwriters laboratory. the use and suitability of these products therefore must be determined by the purchaser. NOTE: all U.L., U.R., and C.S.A. marks shown in this catalog were verified prior to publication. certifications are subject to change. For cord and Switch assemblies go to page H066 click here to view!! !